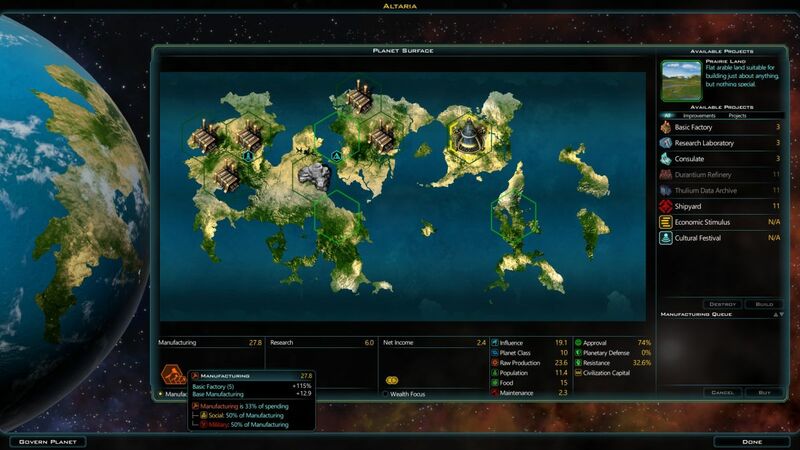 It's been a while since we've looked at Galactic Civ 3. I heard that an expansion was going to be released soon (already?!) and I thought I'd take a look and see what had changed since I last played. The notion that the "Mercenaries" expansion was impending on the horizon gave me a bad feeling, as GC3 was nowhere near finished the last time I'd fired up a game. The common knock that I've always heard about Brad Wardell and Stardock Games is that they release promising games that are unfortunately buggy and incomplete... and then doule down on that problem by releasing expansions and add-ons rather than fix the issues that already exist. Well, let's go ahead and take a look. Standard settings for me, a Small galaxy with tech trading turned off. I picked my favorite GC3 faction, the Altarians. Let's see what has changed. There was a jarring alteration right out of the gate: the spending wheel has been removed from the default planetary screen! I had heard about this, but it was still surprising to see it in action. The player is no longer supposed to allocate spending between manufacturing, research, and wealth on a planet by planet basis. Seeing as how the entire colony management side of the gameplay had been based around this mechanic in the past, the removal of the spending wheel felt like an odd choice, at the very least. Instead, the player is now supposed to use these spending "focuses", the three little dots at the bottom of the screen. Individual planets can be told to focus on generating any one of the three economic goods, but regardless of what the player might want, some of the spending is going to go into all three categories. Needless to say, at the start of the game this is very inefficient. I want to be slamming 100% of my resources into either research (to get better engine techs) or into manufacturing (to build planetary improvements or colony ships). I was not terribly pleased to see the removal of the spending wheel from the default colony screen. Note the inherent inefficiencies in this setup. Altaria is only putting 33% of its spending into manufacturing, and even though I don't want it to be outputting research or wealth right now, it's still forced to do so. Furthermore, that spending is further cut into half social manufacturing and half military manufacturing. What I want to do right now is build colony ships as fast as I can. Instead, only a small percentage of my manfuacturing is actually going into ship construction. For someone like me who really enjoys micromanaging these colonies, the best word I can describe for this is... frustrating. You'll have to forgive me for not finding it immediately, seeing as how the wheel is tucked away under the Govern tab at the top of the screen. So here is the familiar spending wheel again, which I've now set to 100% manufacturing and 100% military to crank out the colony ships for this galaxy. However, there are two problems here. First of all, this is not a planetary spending wheel, it's an empire-wide spending wheel. Any settings that I choose here will apply to all of my planets, not only the homeworld. That's irrelevant at the start of the game but will obviously have major ramifications later on. Now the first two Galactic Civ games worked in this fashion: they only had global spending settings, not individual planetary ones. The difference with GC3 is that the gameplay was specifically designed with planetary spending settings in mind. Nearly all of the buildings have percentage based modifiers, not flat modifiers, like a factory producing +20% manufacturing. The gameplay is very obviously intended to be based around highly specialized planets that focus on outputting one type of economic good: research, wealth, shipbuilding, etc. A global spending wheel simply makes no sense given the way that the planetary improvements have been designed. The two systems do not match. Secondly, there's also the introduction of a new penalty for running the spending wheel too high in any one area: COERCION. On the right hand side of the screenshot, note how I am losing 25% of my raw production for setting the slider to 100% in a single category. That's raw production, not manfacturing - it applies to the base number before any multipliers get added. This is another bizarre design decision that I'll discuss in more detail later. For now, I'll simply say that the gameplay is literally penalizing me here for playing effectively. Maxing manufacturing to pump out colony ships is the obvious One Right Choice in my current situation. So now that we're about to start the colonization phase of the gameplay, did any of the recent patches address the early game issues in GC3? For example, the ability to stack sensors or engines onto hull designs without limit, leading to major problems with sensor ships that can see 25 tiles away and colony ships that move much faster than they should? That's a big negative there, chief. Nothing seems to have been touched in this part of the gameplay at all. As the screenshot demonstrates, I was still able to design a sensor ship that could view things dozens of tiles away. This is still by far the most effective way of scouting out planets in the expansion phase. There are no caps or escalting costs when it comes to engines either; I was able to design a colony ship with 11 movement points quite easily. In fact, I think the engine and sensor modules have actually gotten slightly cheaper than when I last played the game! The life support modules (range extenders) definitely are cheaper now than they used to be. This whole area of the gameplay has always been completely baffling to me. Why not make the individual engines provide more movement points, but limit each ship to the pick of only one engine module? That would solve an innumerable number of problems, particularly in the combat side of the gameplay. Or alternately, let players stack engines but keep escalting the cost with each additional module. That would also be a good fix: you can go faster, but only by taking up more hull space and increasing the manufacturing cost. This is the sort of thing that I expected the patches to be addressing, and it's gone completely untouched. I did manage to colonize all of the available planets in my vicinity. This was a very sparse galaxy indeed; I would have 4 planets and everyone else would have 3 planets, including the Krynn who start with 3 planets in their home system. They were locked out of everything else. The planets that I colonized were really sad ones too: planet classes of 6, 6, and 4. Yikes. I was heading towards the Benevolent ideology that grants a PC10 planet in your home system, since that would make a huge difference in this barren galaxy. Strangely, the Ideology bonuses also appear to be unchanged from when I last played. I thought for sure that the patches would have tweaked them, especially the underpowered Pragmatic tree. Nope, apparently not. A note about the interface: I do like the new sorting options for the planetary list on the right hand side. The player can now sort by manufacturing, research, wealth, population, and so on - a really nice feature to have. Unfortunately, you can't change what information gets displayed on the list, so although I can sort by research, I can't actually see how much research a colony is producing without drilling down into the colony screen itself. I really wish that I could see the beaker output instead of the thoroughly useless credit per turn information (or that pointless planet graphic on the left hand side!) Ah well, still a definite improvement. Unfortunately, the research screen still does not display the beaker cost of each tech! WTF Stardock!!! I'm completely speechless about this. Could the game please tell me how much the techs actually cost to research? Six or seven patches now and that's still not in the game. Yeesh. There are some other major changes to colony management under the hood that took me a little while to notice. Morale still has the same effect as it did before, granting up to a +25% bonus or a -25% penalty to population growth, raw production, and influence. However, the formula used to calculate the morale percentage has apparently changed. Previously, morale was simply happy faces divided by population. If you had 10 happiness and 20 population, then your morale was 50%. If you had 10 happiness and 9 population, then your morale was 100%. The new formula is something different - note that I have 13 happiness and 12.7 population, but Altaria is sitting at 77% approval. What's the new formula? The game certainly isn't telling me. This is another case where the colony management gameplay has clearly been designed to reflect the original morale formula (note that the interface suggests that I should be at 100% morale), only to have a later patch change come along and introduce something else. I don't particularly care if Stardock wants to tweak this formula, but the interface should explain the calculation that's taking place. Instead, the interface is detailing a morale calculation that the gameplay no longer uses! The large empire penalty has also been completely removed from GC3 in the current version of the game. 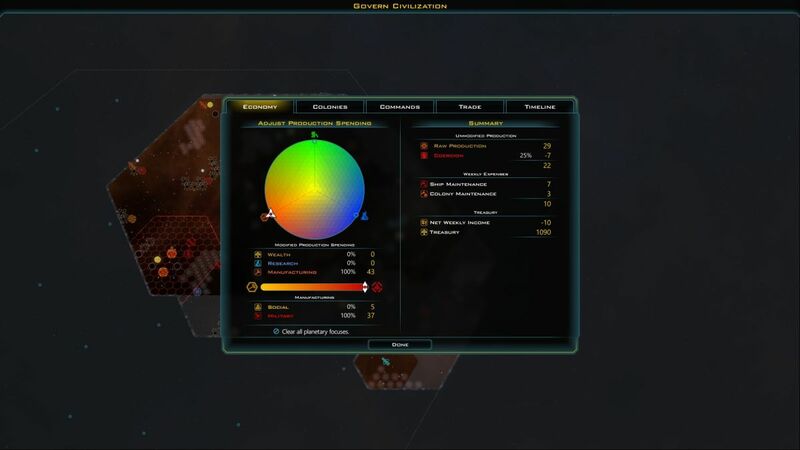 The large empire penalty was the previous system that GC3 tried to keep expansion in check, by applying a flat -0.2 morale penalty for each colony that the player possesed. Most people online seemed to dislike this idea, and it's been removed. I guess that this new morale formula is designed to offset that removal? Otherwise it would be way too easy to run 100% morale, I suppose. The rationale also seems to be that since players will be forced to play the game inefficiently due to the removal of the spending wheel, the large empire penalty could be done away with. I'm not making that up, some of the designer posts on the GC3 forums seemed to be suggesting that. I do wonder though: the large empire penalty was a massive portion of GC3's economic system. Removing it would be akin to taking out Civ4's maintenance costs, or removing corruption from Civ3. Even if it was unpopular with players, should that really be something getting taken out in a patch? I dunno. It's hard to avoid the sense that the designers are shooting in the dark here and hoping something goes into the basketball hoop. That's fine during the Early Access beta, but this game was released eight months ago. It should be essentially done by now. Right? Then there's population growth. In the release version of GC3, population growth was very slow: the base rate was 0.1 pop growth per turn. I liked this idea, as it made management growth a hugely important part of the gameplay. Hospitals were crucially important to get up and running early on, as a tier one hospital along with 100% morale would mean +50% growth, and that translated into 0.2 pop each turn instead of 0.1 pop. 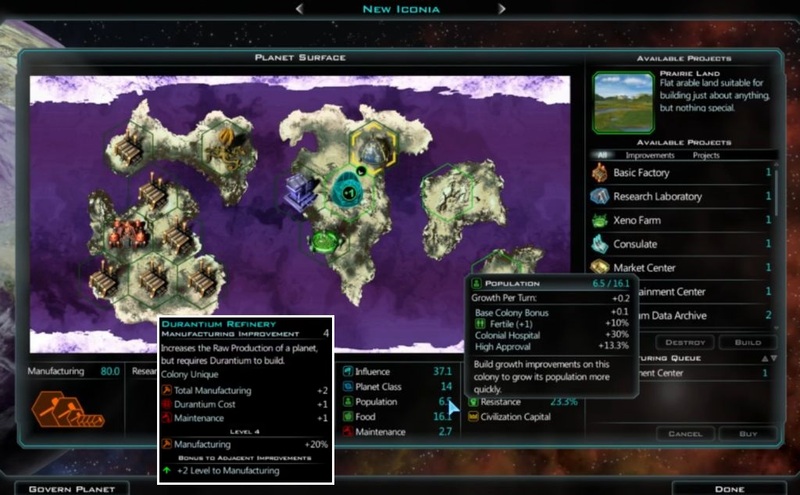 The player needed to manage both morale and growth to get the most out of their colonies. However, in this new 1.5 patch version of GC3, the growth rate has been tripled: now the base rate is 0.3 pop per turn. This is a gigantic change, causing planets to fill up with population quickly regardless of what the player does. In Master of Orion terms, the default pop growth rate has gone from being the Silicoids to being the Sakkra. Furthermore, lining up 100% morale along with the tier 1 hospital now has little effect on population growth: it takes a colony from 0.3 pop per turn to 0.4 pop per turn. Whoop de do. The hospital has therefore gone from being one of the most important buildings in the game to being nearly useless, as population now grows quickly regardless. The one I've built on Altaria is completely useless right now. I'm not suggesting that these changes are inherently bad, only that they reflect a very different style of gameplay. 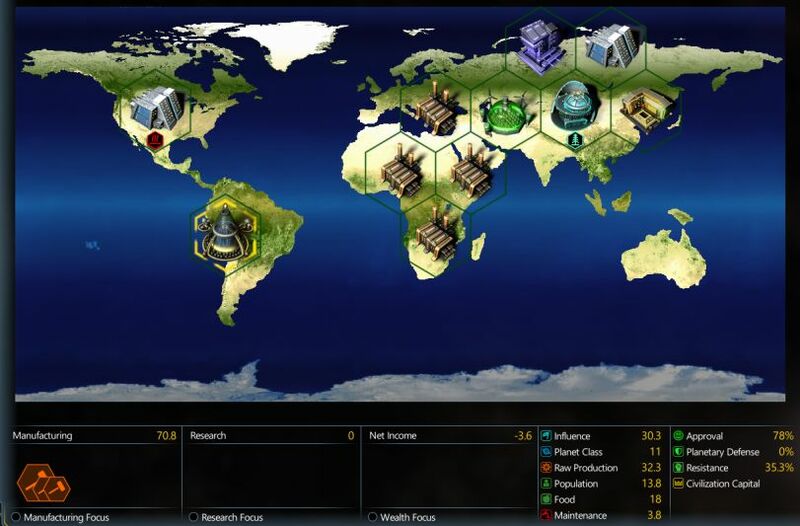 The release version reflected a design that wanted players to manage their colonies very tightly. This new version of GC3 seems to want players to be much more hands-off, queuing up buildings and not delving too much into micromanagement. Again, not necessarily worse, but a very different design philosophy. Research Interstellar Governance and build the Bureau of Labor planetary improvement, and that planet can run the spending wheel again. Of course, that means tying up one of the limited slots on a planet's surface with the Bureacu of Labor improvement, and of course there's no way to remove the 25% coercion penalty for running at max emphasis on manufacturing, research, or wealth. That said, I imagine that you'd still want to do this anyway, since the ability to run targeted specialized planets is so powerful. Or alternately, run at 75% to sit just outside the coercion penalty if that's how the math shakes out the best. I continue to find this mystifying from a design perspective, as Stardock obviously recognizes that highly specialized colonies are the optimal way to play GC3, only to throw up artificial barriers in the way of pursuing that very strategy. I had been expecting them to embrace this style of gameplay - I mean, it was very clear that was the intent behind the original design! - and then balance around it. 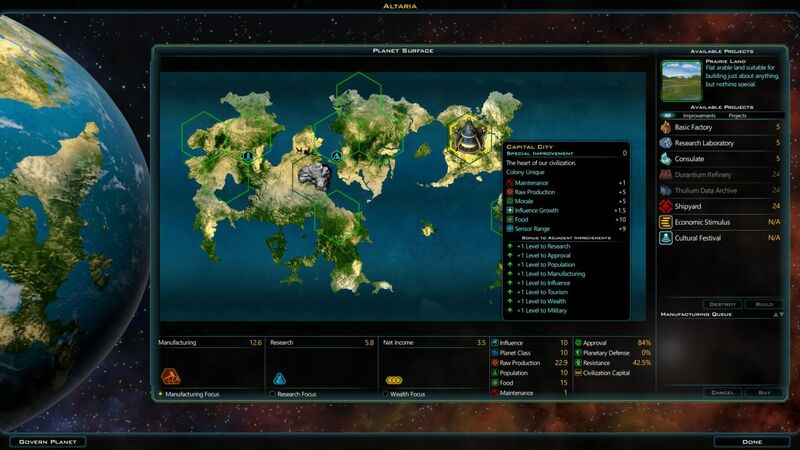 Instead, Stardock has been changing the core design philosophy underlying GC3's gameplay. The whole notion of this Bureau of Labor improvement is exceedingly strange. First the planetary spending wheel is in the game, then it's removed from the game, then it was re-enabled as an .ini setting in a patch, then it's reinstituted in the form of this researchable building. It's almost like the various patch versions of GC3 are at war with one another. So what the heck is going on here? Why do these design decisions appear to be so contradictory? 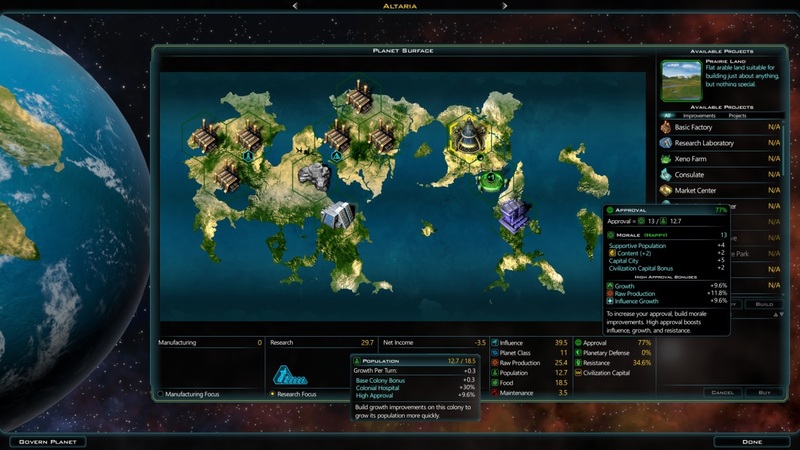 To answer that question, we need to dive deeper into the history of Galactic Civ 3. I worked as a design consultant on GC3 in its earliest pre-Alpha stages. I've mentioned this before on Livestream, but I don't think I've put it in writing. Lest you think I'm making this up, I put a screenshot of some of the GC3 design documents above, shared with me via Google Drive. I never had a playable build of GC3, as this was before any programming had even started on the game. I was sent a series of design documents and asked to provide feedback and commentary on the ideas; I did get paid for this work, back when I was still teaching and finishing up with my dissertation. For whatever reason my name didn't get included in the credits; perhaps it was so early in the project's lifespan that no one remembered. I would have continued working on GC3 once it moved into development proper, but my one-year contract eventually ran out and was not renewed. The contact that I had at Stardock also left the company to work on his own games, and I'm sure that factored into the decision as well. I don't have any axes to grind on this, as I was never connected all that closely to GC3's development, and I had never played any other games in the series. I have no particular attachment to this gaming franchise. I'm bringing up the point to emphasize that I'm uniquely placed to provide a view into the very early stages of GC3's design. Obviously I can't go into any of the details due to non-disclosure agreements, but what I can say is that GC3's original design was very much intended to be a hands-on experience. The creation of the building adjacency system (which I still think is an awesome piece of strategy game design) was specifically intended to favor tight management of colonies. When combined with the planetary bonuses, with individual planets getting boosts to research or production or growth etc., GC3 had a clear design goal of creating heavily specialized planets. 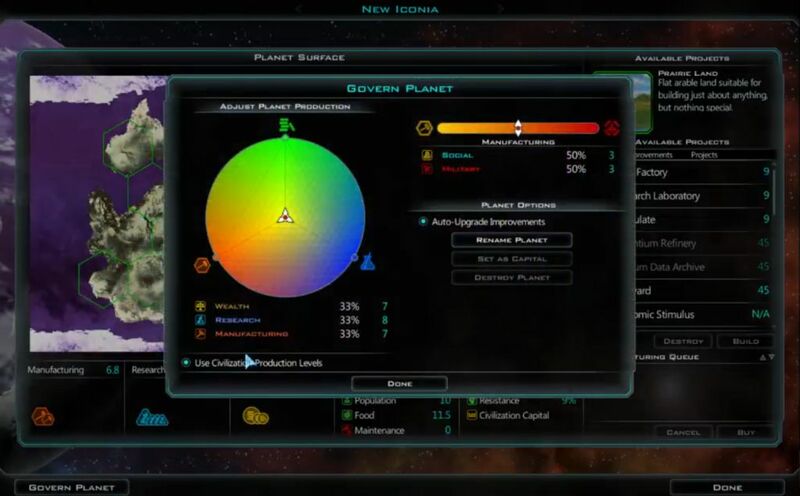 That was one of the stated purposes of the game's design: to make planets feel more unique by creating avenues for specialization. And it's not hard to see that even in the release version of GC3, with the way that nearly all of the buildings granted percentage bonuses rather than flat resources. I�m Brad Wardell. I wrote the original GalCiv for OS/2 and much of GalCiv I and GalCiv II. I also designed those games and wrote their AIs. On GalCiv III I�ve been more of an executive consultant thus far as I�ve been focusing on Ashes of the Singularity for the past couple of years. But GalCiv remains my baby. I�ve spent over 20 years with it. So it matters a lot to me. In GalCiv III 1.0 through 1.3 players could go to the planetary governor and override the global spending priorities on a planetary basis. This made micro-managers very happy and people who don�t like to micro manage very sad. I am in the camp of hating it. HATING it. Not because of the micromanagement because it completely violates what GalCiv has always been about: You are running a galactic civilization. It�s supposed to be half simulation, half strategy game. The wheel is totally gamey. No civilization functions where last being can be assigned a job by the government. I read the forums and I see people talking about the change being made to make the AI easier. That�s a ridiculous argument. Not to be mean but only a non-programmer would say that. Micro-managing is what AIs do best. I could write up an AI that could tweak planetary wheels every turn to a level that would make most micro managers weep. The reason the AI didn�t use the planetary wheel in previous versions is because it was supposed to be eliminated long ago. So there was no point writing AI for this if the feature was going to go away. I found this to be a very revealing and also very strange post. Brad Wardell states that he hated the planetary spending wheel and wanted to remove it from Galactic Civ 3 from the moment of release. In fact, he hated it so much that Stardock apparently didn't write any code for the AI empires to use the spending wheel, because it was the intention all along to remove the wheel completely. (In the release version of GC3, the AI would always remained locked on 33/33/33 percent spending sliders, and they were laughably terrible at playing the game.) I found the rationale behind this dislike of the spending wheel to be interesting as well. Brad Wardell states that he interprets the Galactic Civ series to be a mixture of strategy and simulation elements, that the wheel is "too gamey", and that citizens should not be assigned jobs by the government. In his vision of the Galactic Civ series - which counts for a great deal since he did create the series - the games are more about managing a large empire than controlling the individual details of each planet. Although Wardell claims that this he's not against micromanagement, this is more or less arguing exactly that, moving away from micromanagement and more towards macromanagement. And I have nothing wrong with that viewpoint, in theory anyway. So here's the 10,000 dollar question: if that's the game that you wanted to make, then why was Galactic Civ 3 designed with a completely different philosophy in mind?! This really isn't that complicated. If Brad Wardell has repeatedly stated how much he hated the spending wheel, then why was it in the game in the first place? Colony management could have been handled in some other fashion, one that was more hands-off and simulation oriented. Perhaps something closer to the first Galactic Civ game, for example. But it makes no sense to design interface and colony management gameplay with the goal of specializing and micromanging individual planets, and then release patches that do their best to strip that very ability out of the game! 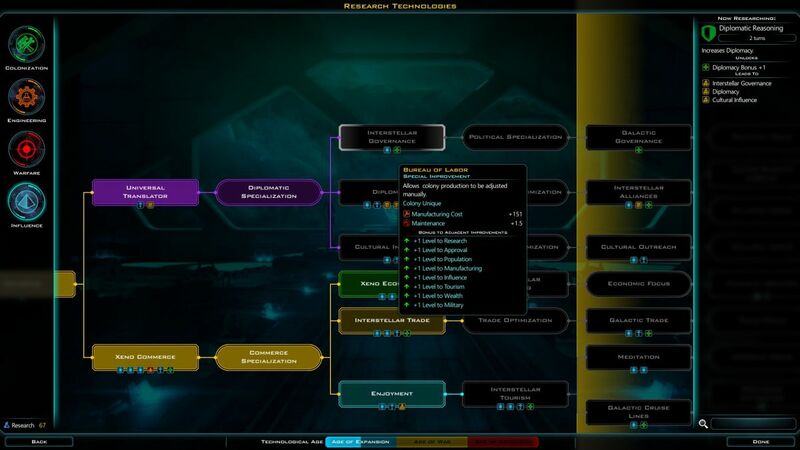 With GalCiv III v1.4, we�ve removed the per planet production wheel. You can read more about that here. This has sparked a lively debate on just how much control a player should have on their economy. 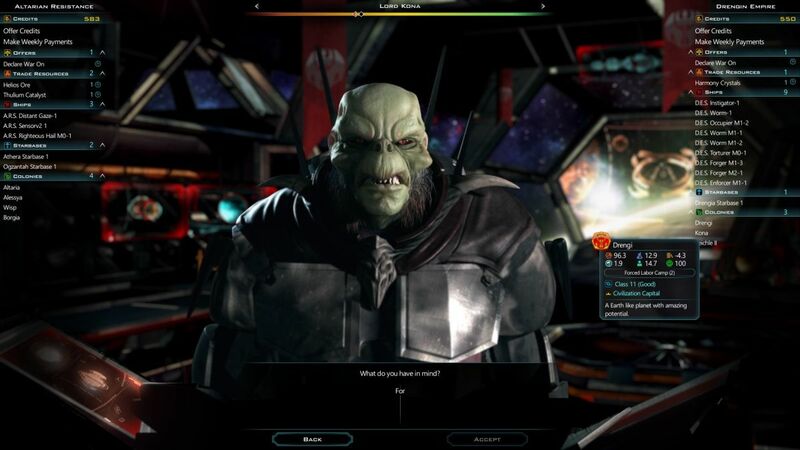 Planets in Galactic Civilizations III can be specialized much more than in previous versions. An industrial world, through adjacencies, can result in massive bonus manufacturing. However, on top of that, players can direct their citizens to work more in those factories via the global production wheel (and previously the local production wheel). So let�s talk about what that actually means. By default, your citizens work at whatever jobs are available on your planets. If you live in the West (USA, Europe, Japan, etc.) you are free to choose the job you want. So in this model, Earth is producing 23.7 quadrillion tons of manufactured goods, 15.1 units of research, and is generating taxable income of 8.7T credits (for GalCiv III we�ve gotten rid of the units of measurement). However, new to GalCiv III is the concept of being able to FORCE people to work certain jobs. That is, I can draft people to go work in the factories or in the labs or raise their taxes. Through the production wheel, I can make people to work in the factories, raise their taxes or help out in the labs. In every previous GalCiv, if you raised taxes, there was a corresponding morale penalty. We don�t have that here because it was decided it was too convoluted to have it just for taxes. However, what we really should have considered is that it�s not that people hate taxes per se, they had COERCION. They don�t like their government controlling their activity. If my taxes are 50%, for instance, that means 50% of the time I�m working FOR the government. Now, I get 70.8, 0, �3.6. You�ll note that this number if much MUCH higher. Total: 67. Imagine if in GalCIv II we let people set their taxes to 100% and there was no downside to this. Now, imagine if we put out GalCiv II v1.4 and we made it so you couldn�t change taxes. People would have been ticked off. Understandably. But I hope also that people would understand that such a system is broken. There�s no such thing a a free lunch. I�ve had a lot of time to think about the production wheel. By reading the forums, at length, I�ve gotten a much better idea of what the issue really is. It�s the free lunch aspect of the production wheel I don�t like. In the real world, command economies don�t do well against free markets in the long-run. But in GalCiv III, they�re absolutely the way to go. The problem ISN�T the wheel on its own (I don�t like the micro management but I have no issue with people voluntarily choosing to play that way). The problem is that you get to coerce people without any downside. Secondly, trying to make some kind of analogy to real world governments has little application in this situation. GC3 is a game, and one of the cardinal rules of good strategy game design is that gameplay concerns always trump realism. Besides, this is a science fiction game with alien races, time travel, faster than light starships, futuristic technologies, and planet-destroying weapons. I don't think Galactic Civ is a good place to through around "real world" examples. Furthermore, the whole idea that using the planetary spending wheel is somehow uniquely "coercive" makes no sense to me. *EVERY* decision that the player makes in a strategy game is coercive. She forces the ships where to move, she forces each planet what to build, she forces the empire to make peace and declare war, etc. That's the whole point of a strategy game: the player controls the empire and makes strategic and tactical decisions. News flash: the people in GC3 aren't real! When we play the game, we're not actually telling anyone what to do. We're adjusting sliders and clicking buttons in a big mass of coding. I can't see how adjusting the spending wheel is any more coercive than building a colony ship - I'm forcing the imaginary people on the planet to do something in either case. But let's leave that aside. I want to focus less on the specific points made by Brad Wardell and concentrate more on the spirit behind them. Wardell presents planetary specialization as though it's a PROBLEM TO BE SOLVED. In addition to the post above, he later made a post in the same thread that stated this: "I've seen saved games where people were getting over 2,000 research PER TURN from a planet. They weren't cheating. They had just mastered the system we had setup beyond what we ever imagined. 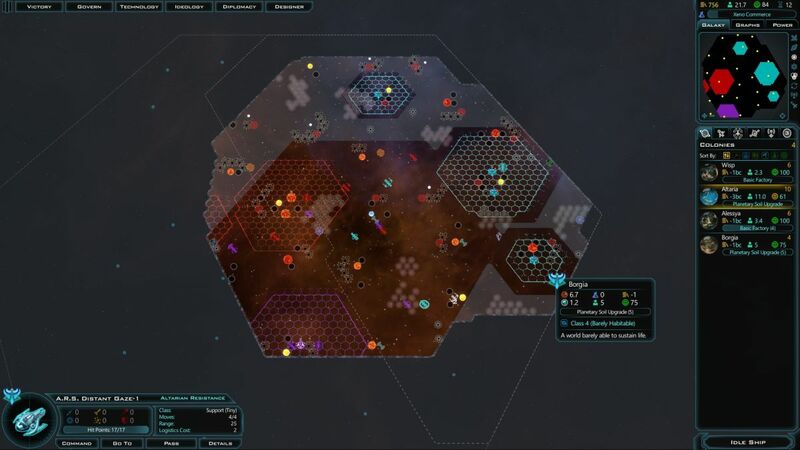 Same has happened in every GalCiv and we always respond by coming up with ways to try to bring those numbers back into line with how the game was designed." The numbers were too high; they had to be corrected. The impression that I get, rightly or wrongly, is that Wardell does not personally do a lot of micromanagement in his games, and doesn't like the things that players were able to achieve through specialization of planets. If I were a developer, I would see someone getting 2000 beakers/turn from a planet (in extreme lategame of course) and think that was really cool and impressive; maybe tech costs need to go up a little bit, but the system itself is working as intended. Wardell's reaction was to try and change the whole system so that no one could get that much research from a single planet. Players were simply specializing too much and manipulating the spending wheel too well. All of that had to be cut out and replaced with a system based more on hands-off macromanagement, more akin to Wardell's own style. So this discussion has led us back to the original point again: why was the planetary spending wheel ever in this game in the first place? Why are the pre-release and post-release design decisions so much in conflict with one another? It's almost like several different people were in charge of designing GC3! Oh. Well. That explains a lot. I don't necessarily think that one style of gameplay is better than another. Although I prefer games that are more geared towards micromanagement, I don't think that they are inherently superior to a more macro-focused, simulation style game. There's a lot of different ways to do game design well. However, I do have a problem with GC3 being designed with one gameplay style in mind, and then trying to shift to another gameplay style after release. That's not going to make anyone happy, and the GC3 forums are testament to how many players have been unhappy with the vacillation back and forth on this subject. The spending wheel stands in here for the larger conflict over the direction of GC3 in general. I also think it's highly unfair to me as customer to advertise that GC3 is going to have this gameplay focused on heavy specialization and micromanagement, then start shifting to more of a simulation game after I've paid for the product. The game is turning into something different than what was originally promised. If Brad Wardell didn't want GC3 to have the spending wheel, and hated it so much that he felt compelled to remove it in patches (and not even bother writing in code for the AI to use it! ), then he should have made sure it was never in the game in the first place. The right time to deal with these issues is during development, and given that GC3 was in Early Access state forever, there was plenty of time to decide these things pre-release. And if someone else was making these design decisions, then I believe Wardell needs to stand back and let the design of his employees stand or fall on their own merits, not seize personal control and start changing things around. Yes, I'm aware that Stardock is Wardell's company, and he's free to make his own decisions. But there's an obvious analogy here to the realm of professional sports. This reminds me of all the times where a team's owner decides to insert himself into the decision-making process, overriding the general manager who's supposed to make personnel decisions and signing players himself. For those of you who follow sports, tell me: how well does that usually work out? I'm glad that Brad Wardell is so passionate about gaming, and his baby the Galactic Civ series in particular. 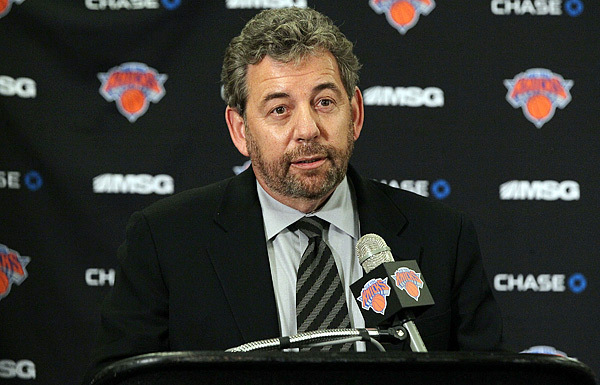 He has a real vision of where he wants these games to go, and I applaud him for his enthusiasm. This is not a case of corporate bigwigs making decisions without caring about gaming whatsoever. Unfortunately, the reverse is the problem here: Wardell cares about his games TOO MUCH. He can't stop himself from tinkering with them endlessly; in his forum guise of Frogboy, Wardell is on the GC3 forums constantly, mixing it up with other posters and wading into the comment section of videos. 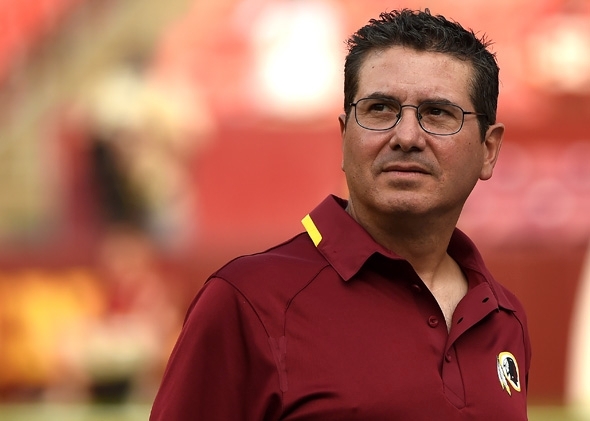 Just as Dan Synder is a huge Redskins fan who can't stop himself from interfering with the operations of his professional football team, Wardell can never let anything go untouched in the Galactic Civ games that his company makes. He keeps inserting himself again and again into the patching process for GC3, changing this and that, turning knobs, pushing buttons, and with every alteration redefining the gameplay to more closely fit with his notion of what it should look like. I honestly don't know why Wardell didn't work as the lead designer on the game from the beginning. I think GC3 would be a lot better if that had happened, as it would have a consistent design theme instead of the... whatever we have now. Stardock likes to write in their press releases that they have the advantage of being both a gaming publisher and a developer. Because they are not beholden to any outside publisher like Activision or EA, they argue that this frees them up to make the best games possible. I actually disagree with that point of view, odd as it may seem. Because Stardock publishes their own games, they're stuck in their own trap. None of their games are ever *DONE*. They're always changing, always being tweaked further - and no, that's not always a good thing! GC3 is a perfect example of this. No gameplay element is ever finished with, no mechanic is ever complete. They are constantly changing, patch after patch, designer after designer. There's no consistency to this setup, the parts never fit together into a greater whole. Gameplay elements are always missing, always incomplete, always in the process of changing to something else in half-finished state. There's an old saying: "Don't let the perfect be the enemy of the good." Stardock is trapped in this paradigm, unable to make a "good" game due to their hopeless quest for perfection through neverending patches and expansions. This is not the way to run a company, and the mediocre user reviews from GC3 bear this out. Some fans like having a game sit in endless development, but most do not. 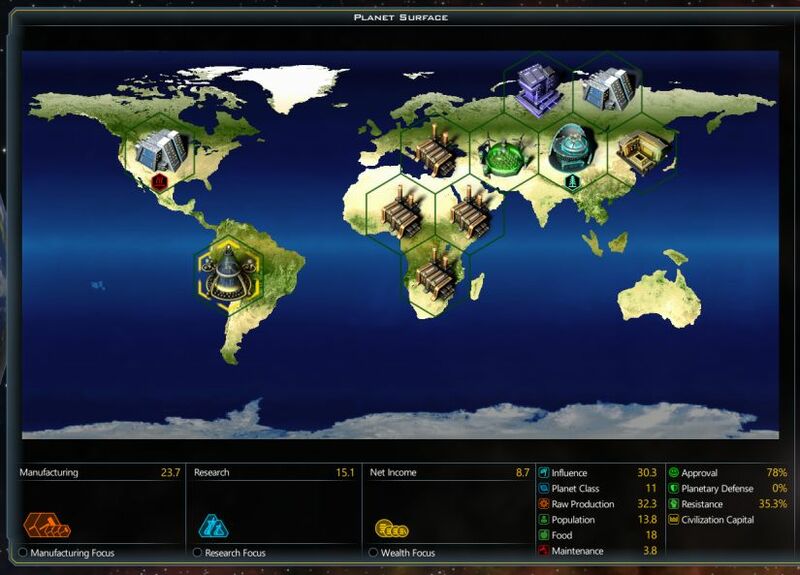 GC3 is a game that would have benefitted enormously from having an outside publisher in place. Someone from outside Stardock needed to say, "I'm sorry Brad, the game is releasing in three months. We're on a feature lockdown now; work on polishing the systems that you do have in place, not adding new ones." As awful as the Take-Twos of the world can be sometimes, publishers serve a necessary function of pushing developers to finish their projects on time and (hopefully) release them in completed form. We've seen what happens with some of those crowdfunded Kickstarter projects, where developers sit back and take an endless amount of time to work. Do I need to link to that awful disaster of a game that Peter Molyneux was working on again? Look, all humans hate deadlines. I know I hate them when we have them at work! But we also need them in place, or else projects are in a constant state of flux, never getting finished, more details always in the process of being changed. While I respect the work that Brad Wardell has done with the Galactic Civ series, someone needs to stop him from constantly going back and making more alterations to GC3. This is like George Lucas and the Star Wars films all over again; they had to be pried away from him before we could get a new film in the series that was pretty good. I probably won't play too much more GC3 going forward. I don't think the game is necessarily all that bad, more that it's moving in a gameplay direction that doesn't fit with what I enjoy. I actually liked the release gameplay a lot, and I was hoping that would stay in place along with some balance tweaks to fix things like AI performance, sensors/engines exploits, planetary invasions, and interface problems. Instead, none of those things have been touched at all, while the designers have been shifting to a more hands-off, macro-oriented gameplay style. 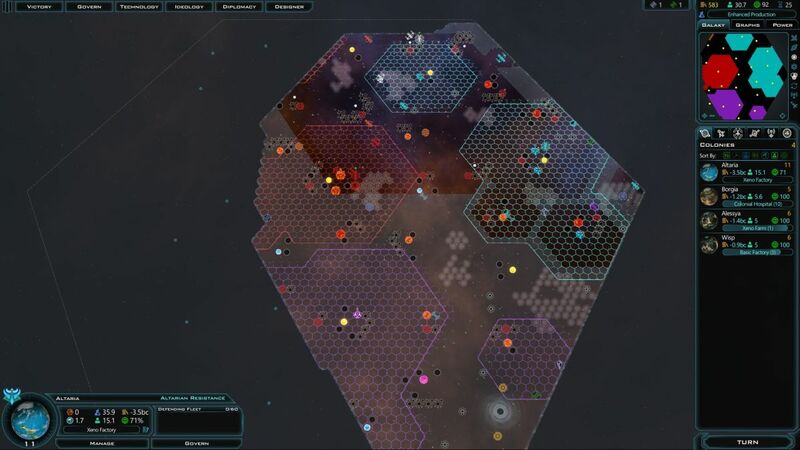 I get the feeling that GC3 is being designed around people who play enormous maps and have hundreds of planets, people who want to fire and forget the spending sliders on each one. I enjoyed GC3 the most when I was working with 5-15 planets on small maps, really controlling the numbers on each one to a very tight degree. I also think that the original GC3 design was intended to be played in this very style. But things are changing through the patches, and as Brad Wardell likes to tell everyone, these are his games and he gets to call the shots. I'm just a random guy on the Internet who doesn't even work in game design, so it's ultimately not my call to make. I did enjoy the time that I spent with this game, and I probably ended up getting my money's worth out of GC3. This could have been a truly incredible game if things had gone differently, but that's life. For me, Galactic Civ 3 will always be a game of missed potential. Methinks there were too many cooks in the design kitchen on this project.